In the first eight months of 2018, Hong Kong’s total exports of toys and games and baby products reached US$4.1 billion and US$730 million respectively, representing year-on-year increases of 8.6% and 13.4% respectively. Hong Kong is also crucial in driving the development of licensing industry in Asia, the fastest-growing region in 2017 at a rate of 8.8%, which is double the global average growth rate. We owe the robust development of these industries to our sound regulatory and institutional framework, including but not limited to that on financial, legal and intellectual property. Our competitive advantage also lies in our strategic position under the Belt & Road Initiative and the development of the Guangdong-Hong Kong-Macao Greater Bay Area which allow us to serve as the link between the Mainland and the rest of the world, and to best capture opportunities arising from rising demands and enhanced connectivity. I am therefore most pleased to see that the well-established trio of fairs have been providing an invaluable avenue for entrepreneurs to showcase and debut a wide array of products in response to the latest market trends and demands. In this regard, I believe that many of you are aware that the Hong Kong Special Administrative Region Government is actively taking forward the initiative to promote STEM (science, technology, engineering and mathematics) education at schools. For those of you who are interested in exploring further, I am sure that you will benefit from visiting the Smart Tech Toys zone in the Hong Kong Toys & Games Fair this year which features various toys and games incorporated with the latest technologies. The concurrent hosting of the trio of fairs facilitates cross-sectoral business opportunities. Take the rapidly developing licensing industry as an example. It provides unlimited opportunities for entrepreneurs from different sectors to meet potential licensees to explore possibilities for expansion to other markets including the Mainland, Asia and beyond. In tandem with these cross-sectoral efforts, the Hong Kong Special Administrative Region Government will continue to promote our unique advantages under “one country, two systems”; and foster business ties on various fronts amidst the uncertainties in the global market. We are actively forging free trade agreements and investment agreements with our trading partners in order to provide better market access to Hong Kong businesses. We will also continue to play a major role in contributing to the development of the Greater Bay Area and seize opportunities arising from the Belt & Road Initiative. These initiatives will not only enhance our position as an international trade and sourcing centre, but also reinforce our unique role as the window for the Mainland market to go global and attract foreign investments. 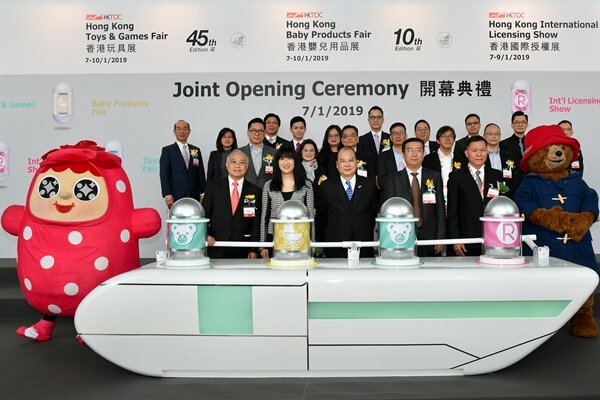 Chief Secretary Matthew Cheung gave these remarks at the Joint Opening Ceremony of the Hong Kong Trade Development Council’s Hong Kong Toys & Games Fair 2019, Hong Kong Baby Products Fair 2019 and Hong Kong International Licensing Show 2019.